Ubuntu 12.04 LTS Server provides access to Ubuntu Cloud, an Infrastructure as a Service (IAAS) platform based on OpenStack. As a cloud technology for public or private deployments, OpenStack has become immensely popular due to its speed, it flexibility and the fact that it is entirely open source. 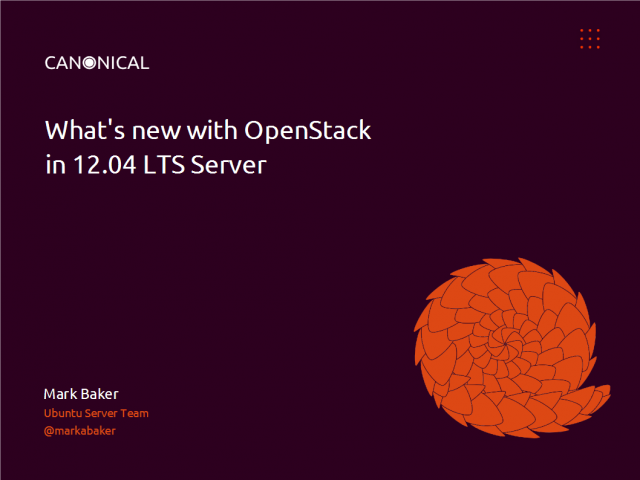 Join Mark Baker and Nick Barcet from the Ubuntu Server and Cloud teams to learn about OpenStack in Ubuntu 12.04 - and how tech titans like HP and Rackspace are deploying large scale cloud infrastructure using OpenStack and Ubuntu. If you have any interest at all in cloud computing, you won’t want to miss this webinar!